More Washington state students are enrolling in four-year college programs than ever before. In fact, more than 52,000 students are enrolled in Private colleges throughout Washington, plus more than 310,000 attending the state's public institutions. Many students are leaning towards earning degrees online as opposed to attending classes on-campus, and major corporations are even partnering with colleges, such as Eastern Washington University’s data analytics partnership with Microsoft, to help them provide specialized, quality curriculum. With dozens of schools to choose from, students often find it difficult to know which online program is right for them-this page takes the guesswork out of the process by providing advice on everything from funding your online college education to finding the best online programs for your interests in Washington state. Schools may meet the needs of students in different ways, and each student’s experience and priorities for college are different. For example, students new to distance learning may want to attend Central Washington University for access to the school's highly-touted advising services. Those who aren’t sure about a major may looking for an online college that provides a wide array of majors like the University of Washington. 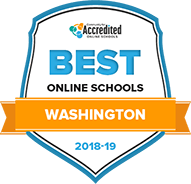 To begin the search for the best school, we’ve helped narrow down the colleges and universities in Washington that are going above and beyond to provide their online students with top-quality education and support services through graduation. Washington State University, provides distance education students with a number of online resources, including an academic advisor, student services, a web-specific student government, tutoring, a writing lab, 24/7 technical help and opportunities to meet others at parties or for-credit seminars. Accredited by the Northwest Commission on Colleges and Universities, multiple options exist to receive certificates, undergraduate and graduate-level degrees in accounting, history, engineering and more. Program length, class duration and graduation requirements are different for each degree. Courses are implemented through Blackboard Learn, and the school's Global Campus multimedia team creates animations and games in an effort to engage students in the curriculum. Students at the University of Washington, which is accredited by the Northwest Commission on Colleges and Universities, can choose from over 70 online education options. You can supplement your studies with free classes, take 2-4 years to complete a bachelor's degree, enroll in a 1-3 year graduate program or earn a professional certificate in fields such as education, social sciences, engineering and business. Informational webinars, academic advising and technical assistance are among the resources available to online students at UW. For those pursuing a graduate education, Gonzaga University offers fully online programs to earn a master's degree in communication and leadership studies, organizational leadership, sport and athletic administration, theology and leadership, or nursing. There are also study abroad opportunities available for online students. Coursework, which is accredited by the Northwest Commission on Colleges and Universities, can be completed at your own pace, and the Student Services Team is always available to guide you through your educational experience. Graduates have entered the workforce as journalists, athletic directors and ministers. Students enrolling in fully online coursework at Central Washington University pay the same tuition as residents. Accredited by the Northwest Commission on Colleges and Universities, the school offers 12 online bachelor's degree completion programs and 10 graduate degree programs in topics ranging from aviation management to school psychology. The Online Student Resource Center connects you with financial aid and scholarship opportunities, tutoring, academic advising and technical help for the web platform Canvas. Graduation requirements and length of time for completion will differ depending on the program, as well as the amount of prior credits being transferred in. Accredited by the Transnational Association of Christian Colleges and Schools, Faith International University is a higher learning institution rooted in Christian values. Students can customize their programs of choice by taking hybrid or fully online courses to complete 4-year bachelor's degrees in religion, education, leadership or business. These options are also accessible for a master's degree in leadership ministry, Christian counseling, Christian education or theological studies. Some classes are implemented through the online platform Canvas, while others are available on DVD. Residents and online students receive the same tuition rates, and discounts are available for YWAM missionaries. Heritage University, which is accredited by the Northwest Commission on Colleges and Universities, offers a fully online program for earning a Bachelor of Arts in English. Students graduate after completing 120 credits, and often enter into fields such as journalism, public relations, education, and grant writing. If you already possess a bachelor's degree, there are online options to work toward a graduate degree or professional certificate in educational administration, English, or ProTeach Portfolio. All courses are self-paced, and online students have access to resources such as the library and virtual bookstore. Over 20 programs at City University of Seattle are delivered in a number of formats, including hybrid, fully online, and through a regional cohort model, which requires students to view lectures online so that on campus visits are reserved for projects and discussions. You can participate in a 39-credit, 16-week program to earn a Master of Science in Information Security, or transfer credits to complete a Bachelor of Arts in Management, among others. Although prerequisites, program length, and amount of credits for graduation differ per degree, all coursework is accredited by the Northwest Commission on Colleges and Universities. Financial aid and military discounts are available to assist in tuition costs. How can I find which online colleges offer the degree I'm looking for in Washington? Students hoping to get an initial look at the colleges around Washington can begin their search on the State of Washington website, which lists private and public colleges and universities. Beyond that, each school's website should detail the online degree programs and class options they offer. Some colleges is Washington have transitioned their entire departments to provide online programs. Central Washington University, Washington State University, and Heritage University list all of their online programs in one place to make it easier for prospective students to find the specific programs they’re looking for. Which online schools in Washington will accept my transfer credits or work/life experience? Many students bring valuable work and life experience to the table, experience they don’t want to go to waste when they think about going to college. Some online colleges in Washington reward this experience by granting credits toward students' degrees. For example, students who attend Northwest University and Central Washington University can simply take a prior learning assessment exam to determine if their experience can serve as a substitute for required coursework. The Washington Student Achievement Council provides further guidance on the college paths students with transfer credits can take in the state. How Much More Do College Grads in Washington Make? Although earning a higher salary serves as one important reason to complete a degree, the benefits for Washington workers do not end there. In fact, those without a degree often fail to find a job at all. According to Georgetown University's Center on Education and the Workforce, by 2020, 70 percent of positions in Washington state will require some form of college education. The Washington State Department of Commerce reports that the highest-growing industries in the state include clean technology, aerospace, information technology, and healthcare — all of which require highly-skilled and educated workers to fill positions. Students enrolled in online programs at Washington colleges and universities expect a quality education. To ensure that they receive the same level of instruction as their on-campus counterparts, students should find an accredited program regulated by the Northwest Commission on Colleges and Universities. When well-known schools like the University of Washington and Washington State University earned their accreditation, they underwent an evaluation of their programs and curriculum to ensure that they provided the knowledge, abilities and skills that students need to succeed in their careers. In some cases, an individual specialization within a larger college program may also hold accreditation status of its own. For example, the nursing program at the University of Washington holds accreditation from the Commission on Collegiate Nursing Education, and its pharmacy programs hold accreditation from the American Society of Health Systems Pharmacists. Similarly, Washington State University's business programs hold accreditation from the Association to Advance Collegiate Schools of Business, and its elementary and secondary education degree holds accreditation from the Washington Professional Educator Standards Board. To make higher education more affordable for Washington residents, the state legislature passed a measure in 2015 that reduced the tuition rate for state colleges. As a result, in the 2015-2016 school year, the in-state tuition rate fell to $7,782, according to the National Center for Education Statistics — down from $8,299 in 2014-2015. However, out-of-state students who attended a public college in Washington paid $28,849 in 2015, and students who attended private schools paid $34,412. All Online Students Pay the Same – Northwest University charges the same rate of $425 for all online credits. Capped Online Rates - At Central Washington University, students pay a per-credit rate for only their first 10 credits per semester; those wishing to take up to 18 credits are not charged above the 10-credit cap. Discounted Military Rates – Some programs may provide discounted rates for online students with military service backgrounds. Separate In-State & Out-of-State Rates - Washington State University charges $507 per credit for state residents and $565 for out-of-state students. Washington residents can save a significant amount on their tuition rates when they attend public colleges in the state. However, students in nearby states can also enjoy cost savings when attending an online college in Washington through the Western Undergraduate Exchange program. This reciprocity program allows students from participating states to pay rates closer to in-state tuition rate at participating schools. To qualify for this discount, students must come from Oregon, California, North Dakota, South Dakota, Arizona, Utah, Colorado, Wyoming, Montana, Nevada, Hawaii, Alaska, New Mexico or Idaho. More answers to students’ questions about paying for online college in Washington are answered below. What are Washington's requirements to qualify for in-state university tuition? When students relocate to Washington, they can establish state residency and qualify for in-state tuition rates. To do this, you must live in the state for 12 months prior to requesting the residential tuition price. In addition, students must relinquish legal ties to their former state by getting a Washington driver's license, registering a vehicle, opening a bank account, or registering to vote. Are online credits more affordable in Washington than other places? Although online tuition rates depend on the specific school that students attend, the $507 per-credit rate at Washington State University is higher than what students may pay in some other states. For example, Oregon State University-Cascades Campus charges $296 per credit, the Corvallis Campus of Oregon State University charges $303, and the University of Idaho's per credit rate cost $374. Other colleges in the state of Washington may even charge less than one another for online credits, like Northwest University, where online students pay tuition of $425 per credit hour. How can I get help paying for online college in Washington? Ray DeVries Memorial Scholarship: Offered by the Washington Farm Bureau, this scholarship goes to students enrolled in an agriculture program. Students must hold current membership in the organization, or be the child of a member. Greater Tacoma Community Foundation: This organization provides scholarships to help residents achieve their educational goals. It has provided over 3.5 million in funding over a 35-year period. The American Indian Endowed Scholarship: Washington residents who are Native American qualify for this scholarship. Ecosystems Scholarship: This scholarship goes to Washington students enrolled in a major related to land use planning or natural resources, such as environmental science, renewable energy, climate change, or ecosystems management. The Community Foundation of South Puget Sound awards this scholarship. Blue Ribbon Scholarship Program: The Washington State Fair Foundation provides this scholarship to residents. To begin the process of getting awards to pay for college, students must fill out a Free Application for Federal Student Aid, or FAFSA, which allows schools to determine the amount of financial aid for which a student qualifies. Basic Academic Education – Teaches foundational skills in math, reading and writing to better prepare adult students for college coursework. Accelerated Learning – The iBest Program helps Washington’s aspiring students work through basic education while earning credit for college-level courses simultaneously. High School Diploma programs – For adult students in Washington who haven’t yet completed a high school degree. Adult education programs in Washington provide services to people from diverse walks of life, including ex-offenders, displaced homemakers, single parents, and people with disabilities. For more information on specific programs in your area check this providers directory.